Background: Atherosclerosis is a multifactorial inflammatory disease of the cardiovascular system. It has been suggested that periodontitis, an infectious disease of oral cavity caused by gramnegative anaerobic bacteria, could be linked to atherosclerosis. 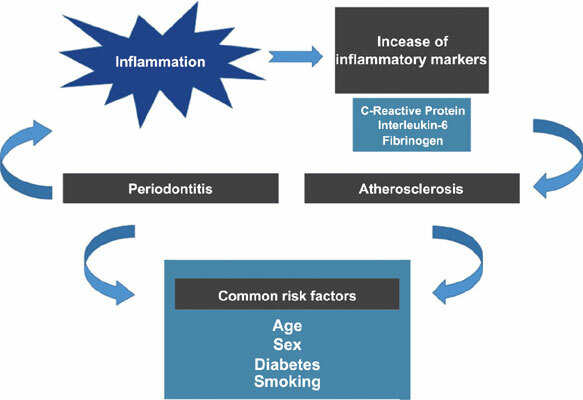 Objective: The objective of this systematic review was to assess the evidence between the association of periodontitis and atherosclerosis in adults. Methods: A systematic literature search was conducted in 7 databases up to January 2017, according to the Preferential Reports for Systematic Review and Meta-analysis (PRISMA) guidelines. Studies in humans with atherosclerosis were considered eligible when considering a group exposed to periodontitis and a control group (absence of periodontitis), in which the primary outcome was the association between the 2 diseases (atherosclerosis and periodontitis). The synthesis of the qualitative studies included was evaluated using previously validated checklist for assessing the risk of bias. Results: Among the 2138 studies found, 4 observational studies met the eligibility criteria and were included in the qualitative synthesis. All articles were considered adequate, presenting consistent and valid information. The results of the selected studies show the expected effects, being considered as low risk of bias. Conclusion: The available evidence indicates an association between the 2 diseases, with elevated levels of inflammatory markers, mainly C-reactive protein and interleukin 6. Atherosclerosis, cardiovascular diseases, periodontitis, periodontal disease, LDL-C, HDL-C.